TapeStreamFX™ provides FAST mainframe backup and dramatically reduces batch job time. Take advantage of TapeStreamFX 's enhanced data compression to reduce data storage by up to 80%. Improve reliability by TapeStreamFX™ use of 64-bit CRC technology on each block of data. 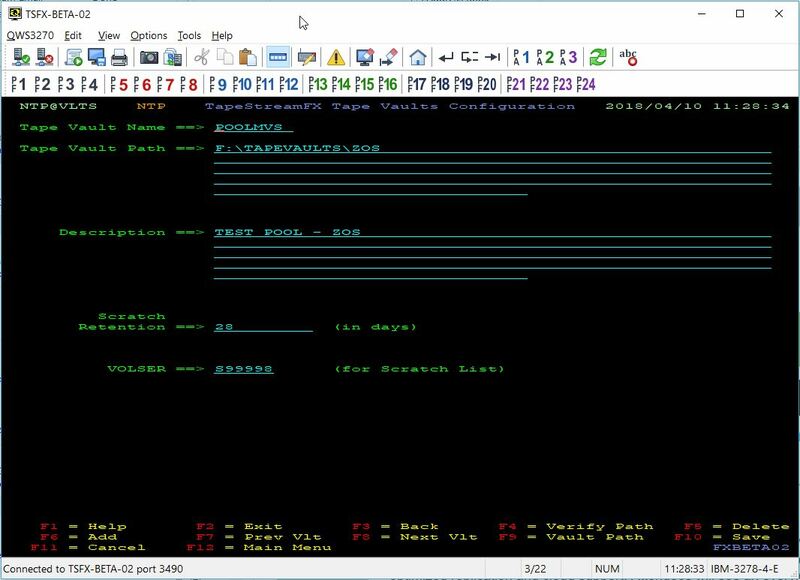 TapeStreamFX™ VTL provides IBM tape emulation using a FICON connection and uses your enterprise data storage solution for tape images. It improves reliability by using 64-bit CRC technology on each block of data. Tape volume changes are almost instantaneous. Volumes are “mounted” immediately using local disk storage. TapeStreamFX™ is very simple to install, configure and use. It uses a TN3270 console management service that can be accessed directly, from the mainframe or your enterprise chosen client, with an intuitive interface. Save time with TapeStreamFX's automated tape management that reduces tape mount time and eliminates operator intervention. All tape volume management functions can be automated through batch jobs. TapeStreamFX™ uses your enterprise SAN/NAS appliance for tape volume image storage. TapeStreamFX™ works with existing mainframe tape management systems and all leading dump/restore utility software. TapeStreamFX™ does not require any JCL or additional mainframe software. TapeStreamFX™ uses enhanced data compression with up to 80% reduction in data storage and a file location index to reduce the time to locate individual files. TapeStreamFX™ scratch management uniquely gives you the option to archive "scratched" tape volumes for a user-defined period of time. Set the control period of scratched tape volumes for as little or as much time as you want. Recovery of an accidental scratching of tape volume is at your fingertips. TapeStreamFX™ is FAST and dramatically reduces batch job time! Enhanced data compaction with up to 80% reduction in data storage. A file location index, reduces the time to locate individual files.